Cycling the Massif Central mountains offers cyclists some of the most challenging terrain for their cycling holidays in France. These volcanic mountains are very different in character and structure from those in the Alps or Pyrenees. In spring and summer they are clothed in green changing to the dramatic reds and golds of autumn. The Massif Central mountains are more rolling and less severe than other mountain ranges of France. This gives the cyclist a slightly different cycling experience. We organise day trips to the mountains which are an easy drive from our base in the Corrèze. There is something here for all abilities. Try a gentle climb up from the stunning walled mountain town of Salers to the Col De Neronne (1242m). Alternatively you can ride the challenging route up to Pas de Peyrol (1588m) whose last few kilometres average 12 to 15%. The Peyrol has featured recently in the 2011 and 2016 Tour de France and is a perfect challenge for adventurous cyclists. Salers is classified as a ‘plus beau village de France’ – a most beautiful village. So it is worth visiting just to see this stunning medieval town! If you want a real challenge there is the little-known Col Du Perthus which is accessed from the lovely little village of Mandailles-St-Julien. The village sits at the head of the Valley De La Jordanne on the route to the Peyrol from the south. After a strong coffee in Mandailles you will be ready for the relatively short but punchy 5km climb. It never seems to go below 10% and sometimes reaches 14-15%. This climb was used in the 2016 Tour de France and seemed to provide as big a challenge to many of the riders as did some of the longer classic climbs in the Alps. The feature picture for this Blog was taken when we took a group to watch this very stage. We could see the pain on the riders faces as they passed, the climb splitting the field wide open. 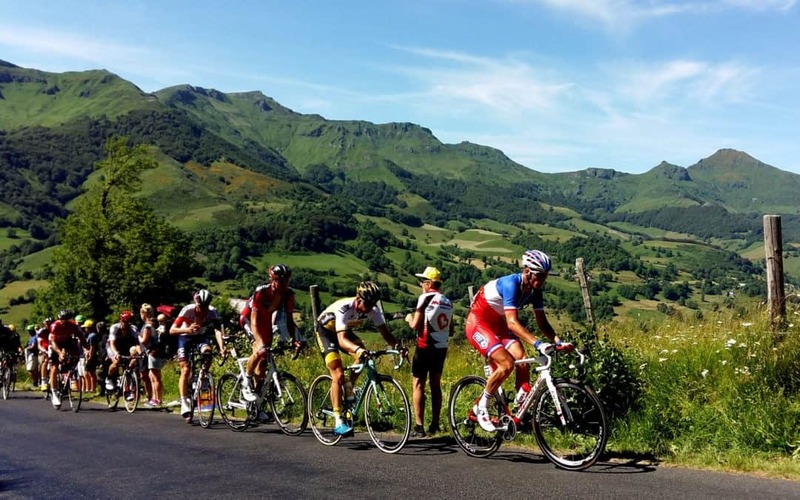 One of our favourite circuits for your Bike Tour in France includes the ascent of the Peyrol known as Puy Mary. It starts in Velzic in the Jordanne valley which is about a 75-minute drive from our base. Starting at an altitude of 700m, the D17 majestically winds its way up the beautiful valley at a gentle gradient until Mandailles. This is where the true climb begins up to the Peyrol. The first half of the climb is easily the hardest with the grade reaching 7-10%. Then as you emerge from the tree line at the 5.5km point it gets a little easier and you get the spectacular views of the climb and surrounding mountains. From the top, the 360-degree views are worth a stop and a well-deserved drink before the steep descent and gentle climb across to the Col De Neronne (1242m). There follows a gentle ride down to Salers on the D37 which clings to the side of the long U-shaped valley. After lunch and refreshments in one of Salers many lovely restaurants the route heads back south via the Col St-George and the Col De Legal (1229m). The day finishes with a breath-taking descent back to the crew bus for tea and cake. If you drive here on your own, make sure you have something tasty in the car waiting for you. The idea of cake can keep you going during the last climbs of the day! The distance of the circuit is 80km and the vertical ascent is approximately 1550m. There are more of our favourite circuits in this part of the Cantal which we will cover in future posts, so stay tuned for more ideas of great rides in this area.